We women know that the day we tie the knot will remain one of the memories we will cherish most in our lives. We also know that the preparation process can lead us to the verge of insanity if we don’t take care of ourselves. 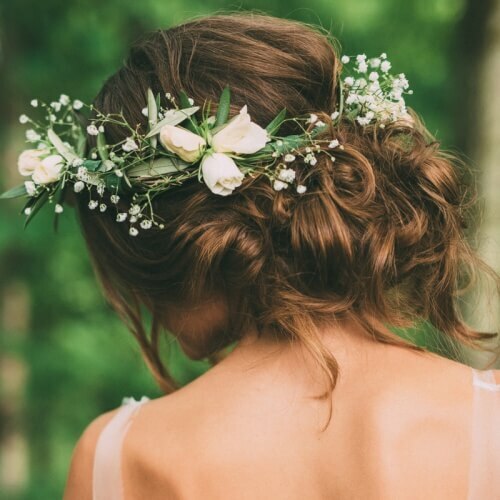 To help you prevent becoming Bridezilla through all the stress, we have handpicked a phenomenal collection of wedding updos to inspire you. Blessed with long and thick hair? 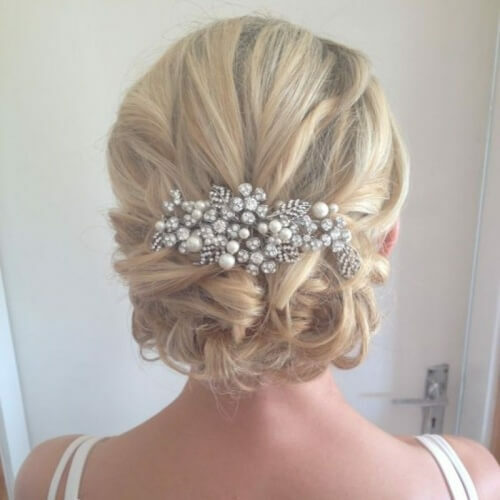 You have a wide variety of wedding updos to choose from. Some of the most beloved options involve loose, sweeping updos that come with an abundance of natural volume. The stray locks in front complete the look. Without a doubt, chignon hairstyles are one of the top wedding updos of all time. Women around the world embrace this hairstyle for its elegance, shining through effortless simplicity. 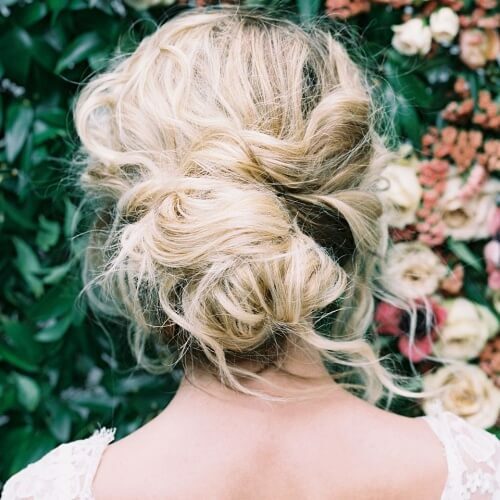 This is just one of the ways you can style your chignon for your wedding. If your wedding will take place on a beach, why not incorporate the theme into your appearance? 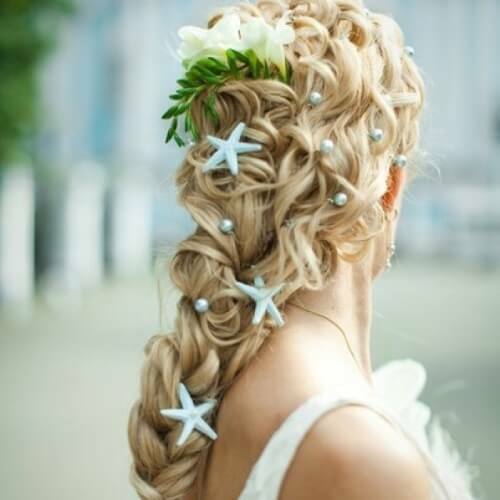 In addition to getting a mermaid-inspired dress, you can also brighten your hairstyle with various accessories. Stars and pearls are just an example. Just like chignons, high buns serve as timeless hairstyles that will always be appropriate for any formal event. 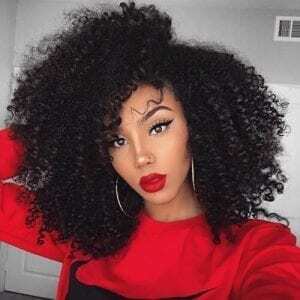 They work particularly well if you have straight hair, but having naturally wavy or curly locks can increase the overall volume of the hairstyle. Not all eye-catching wedding hairstyles are fully swept up. Quite the contrary, some of the most flattering are just half up. To make yours even more memorable, add some fresh flowers or other accessories that match your dress. Even if your hair is short, you can play around with alluring hairstyle ideas for your bridal look. A clever way to accentuate your natural beauty is to wrap your hair in a low ponytail and curl the tips. 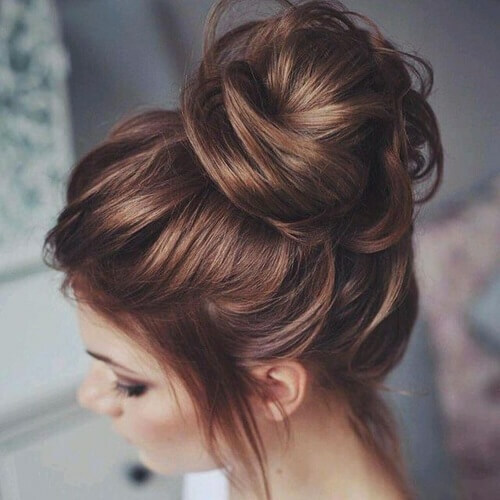 You will get a bun-like result that will make heads turn. How can you possibly resist the French twist? If your style leans towards basic, yet elegant and effective, you don’t need to look any further. Wrap your hair into a jaw-dropping French twist and enjoy an easygoing hairstyle. What if you have bangs? The truth is that it’s more challenging to find wedding updos that also support ladies with bangs. Nonetheless, you can try one like the loose updo in this shot with Carly Rae Jepson if you have full, arched bangs. 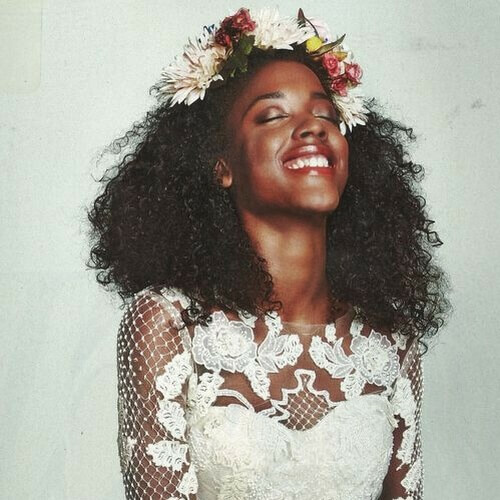 If you have afro-textured hair, we warmly recommend going all natural for the big day. You can style your corkscrew curls in numerous ways, including a few picture-perfect wedding updos. This crown-like hairstyle looks even more amazing with the pearl headband. We have covered hairstyles for women with arched bangs, but what about those with side swept ones? As you can observe, side bangs are far easier to fit into any loose swept up hairstyle. All we additionally recommend is that you follow the natural direction of your part. Medium-length hair is highly easy to style for weddings. 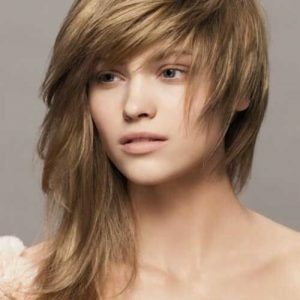 Considering that the length is pretty generous, you will be able to bounce around different style ideas. One of them can be this high bun with curled tips. Another simple yet head-turning hairstyle you can adorn is the traditional ponytail. Don’t be fooled by the fact that it’s a basic hairstyle ready in minutes. It comes with a strong dose of natural elegance that any glowing bride will appreciate. All the same, low ponytails can have just as much of a ‘wow’ effect on your appearance as high ones. In fact, they can be even more appropriate for your wedding, depending on the general theme and dress code. Try out several styles until you get the perfect one for you. Racing against time to get your bridal look in place? 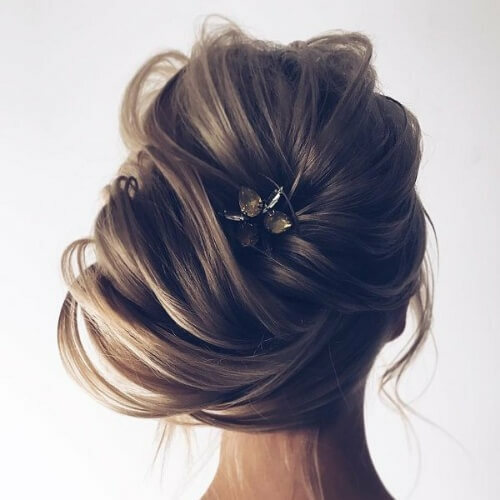 You can count on this updo for a quick yet gorgeous appearance. Make sure that you tease your hair to get that extra volume, pulling your strands apart. Hairspray will be your best friend. 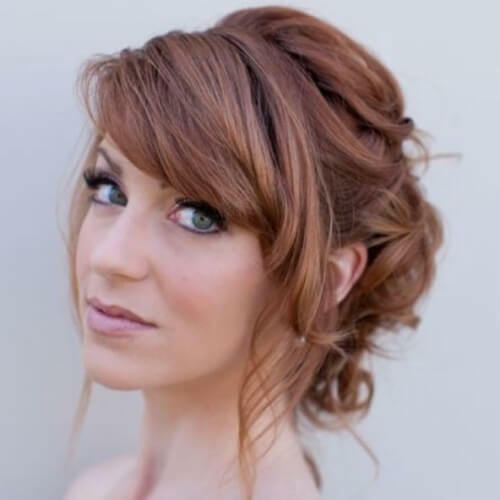 When researching wedding updos, you will find that a great deal of them are styled to the side. This approach comes as a sign of elegance, and is also suitable for all face shapes. Feel free to add any accessories to your side updo. You may believe that having a bob haircut is an impediment for a meaningful wedding hairstyle. Think again. You can easily wrap your way to a sublime half up hairstyle with a sparkling hairpiece placed neatly in the middle. If you struggle with thin hair, it’s best to seek wedding hairstyles that shine through volume. For example, you can rock any swept up hairstyle that involves plenty of teasing. Please take caution with the teasing though, so you don’t end up damaging your hair. No matter if you have a vintage wedding dress or you simply adore retro fashion, this is the updo for you. The curled bangs provide a sense of pin up style that makes the look all more superb. Try it out if the 50s inspire you more than anything. 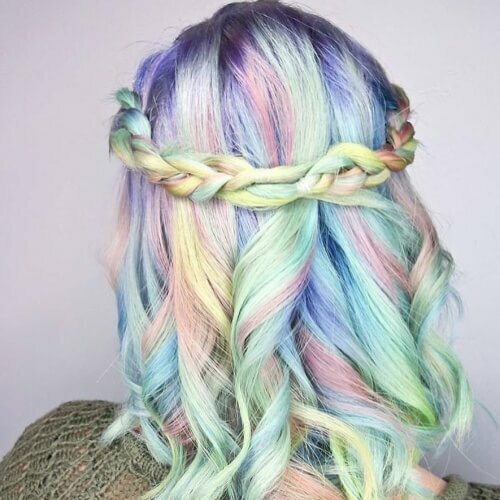 What if your hair features a fabulous blend of vivid colors? 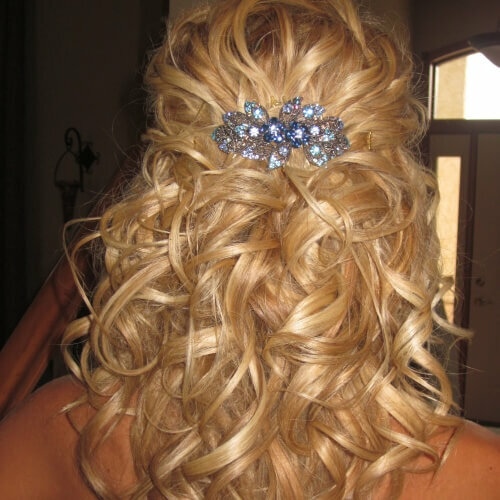 You should look for a wedding hairstyle that complements them accordingly. Nevertheless, we recommend going for a basic approach to prevent complex styling from stealing the spotlight. Yet another way you can adorn a chignon hairstyle on your wedding day is styled to the side. 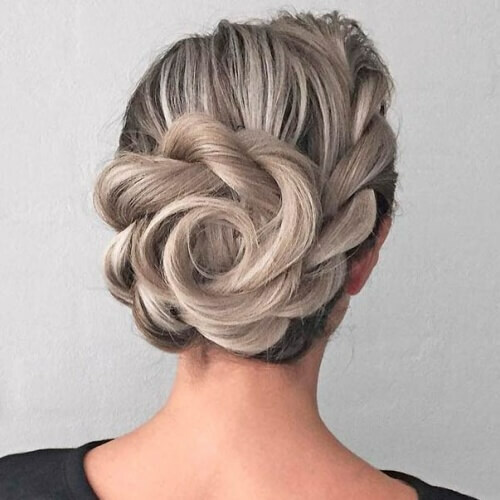 Whether you decide on a simple silhouette or an intricately wrapped chignon, all you have to do is create it gracefully on one side. Pick a hairpiece that matches your bridal jewelry or dress. Speaking of side styling, feel free to get inspired by this loose and lush look. The updo is ever so carefully pulled apart and to the side for a highly chic result. Oftentimes, you don’t have to go over the top with your wedding updos. This is the case especially if you have a showy dress or bold bridal jewelry. If you want to keep things sweet and simple, consider a low, rolled up hairstyle, with or without a hairpiece. 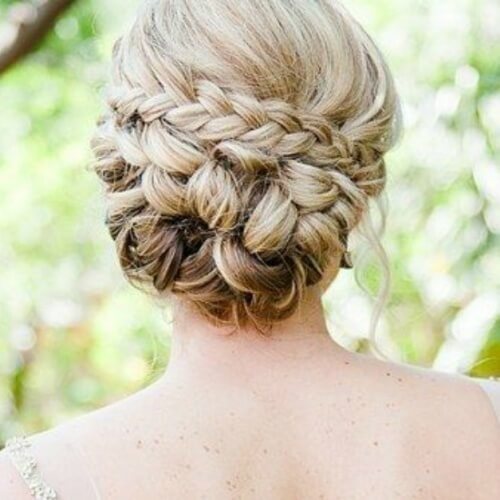 You should never shy away from exploring braided wedding updos. 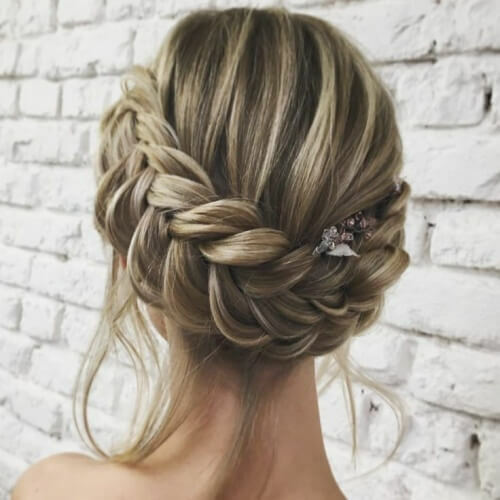 In this category, you will find endless inspiration for creatively styling your locks on the most important day of your life. Just an example is this delicate braid with loose locks. 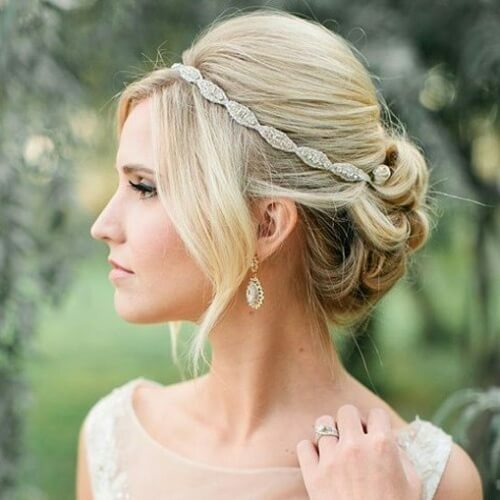 Want your wedding hairstyle to truly stand out? Consider taking a textured approach to yours. To get the outcome you’re looking for, we recommend you work with a professional stylist. The results should be dynamic and alluring from all points of view. Half updos open up a world of infinite styling opportunities. If you’re not into the idea of simply pinning your hair halfway up, you can separate the two sections with a braid. 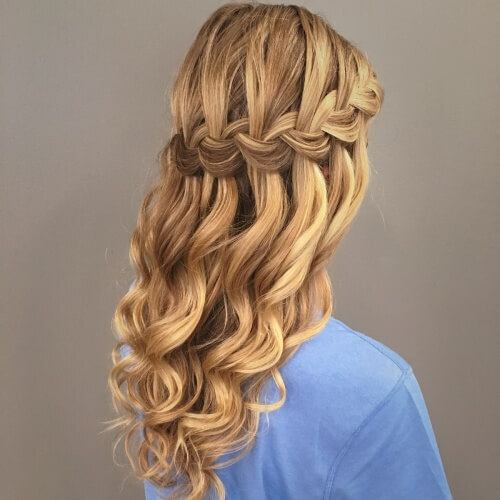 Not just any braid, but an attention-grabbing waterfall braid. Naturally curly hair deserves a wedding hairstyle that does them justice. 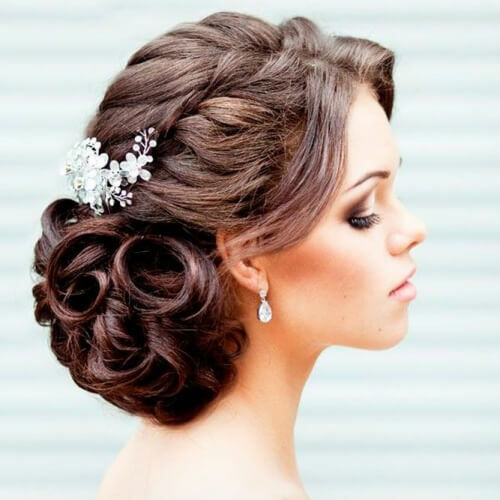 To put it otherwise, you should search for wedding updos that accentuate your hair texture. Don’t hesitate to look into half up half down options so your curls will get all the emphasis. Want your veil to receive just as much attention as any other part of your wedding look? We encourage you to seek low wedding updos that can hold the veil suitably. Chignons, for instance, are a popular choice thanks to this aspect. Although we always vouch for simplicity, we are always well-aware that a complex hairstyle works amazingly with a simple bridal gown. As such, we encourage you to venture into the intricate side of hairstyles if this is the situation for you. 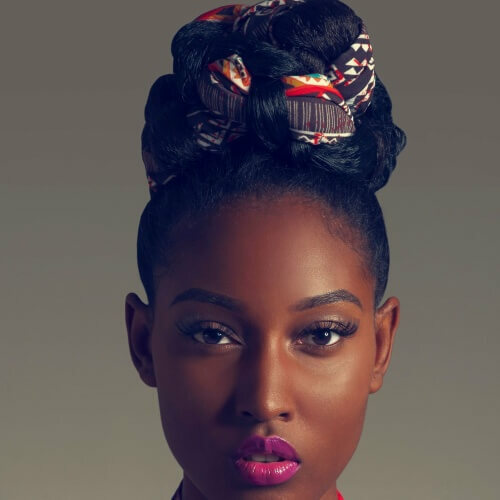 What if you’re torn between braided hairstyles and buns and you can’t make up your mind? Well, you should know that you don’t even have to. In fact, you can boost the originality of your hairstyle by combining ideas in this manner. 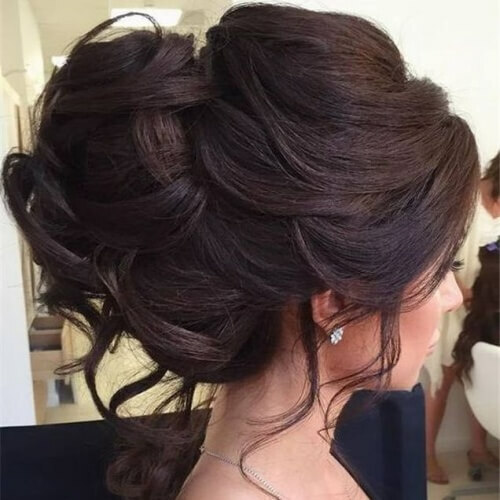 If you’re attending a wedding not as the bride but as a guest, we don’t recommend opting for complicated updos. You don’t want to risk taking away the bride’s shine or having your look overdone. 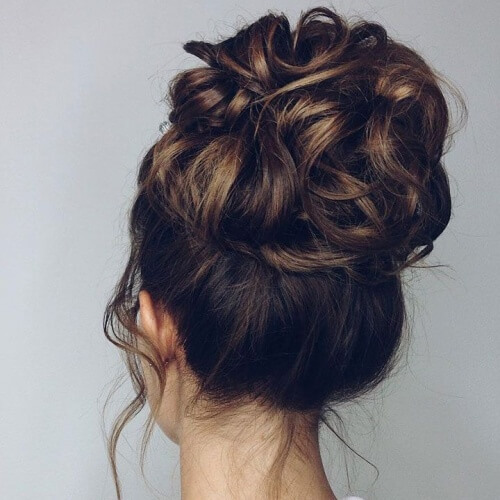 You can rely on a loose low bun to get the job done. Never hesitate to turn to your culture for style inspiration, especially if you want to embrace your roots on your wedding day. Women of African origin, for instance, can mix prints from their traditional head wraps to obtain a genuinely special hairstyle. A precious headband can go a long way for impressive wedding updos. Not only will the headband take the whole hairstyle to the next level, but it also has practical benefits. 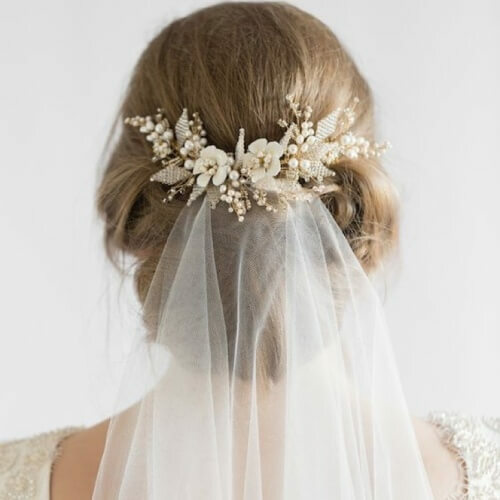 Think about using one for your bridal updo to hold up your veil as well. 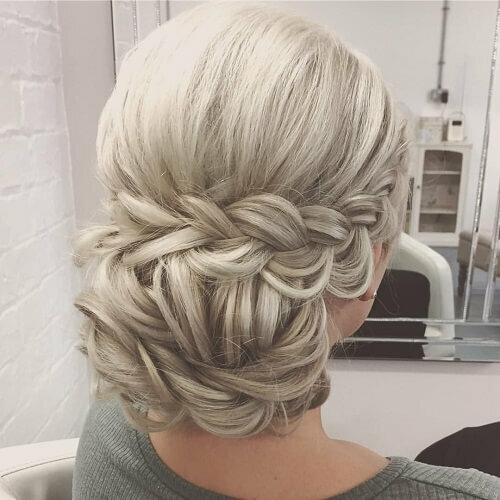 A braided crown will always help you get the results you desire from a stunning wedding hairstyle. This styling technique allows your face, collarbones and shoulders to be free from hair, while focusing on your facial features. African American women have a splendid advantage that they should always showcase: bouncy, abundant and heart-stopping natural curls. In this regard, your hairstyle should be designed in order for your ringlets to pop even more. 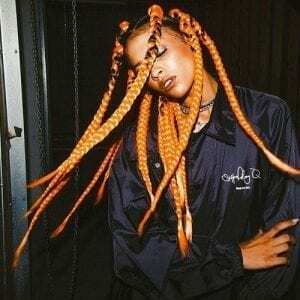 It’s easy to see why fishtail braids are experiencing a major increase in popularity in the last few years. With this braiding style, you can create an unforgettable faux hawk on the day you exchange I dos. Don’t forget – loose is better. 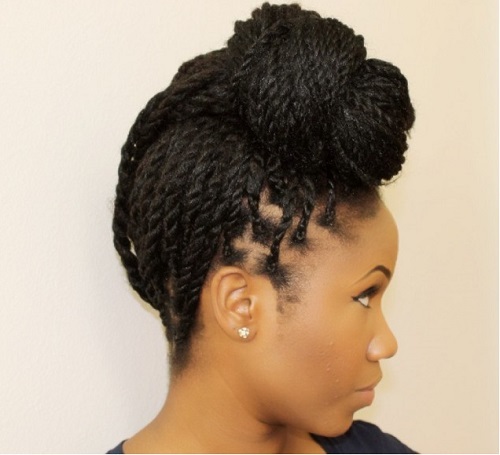 To continue our braided hairstyle ideas, feast your eyes on this marvelous knotted bun. 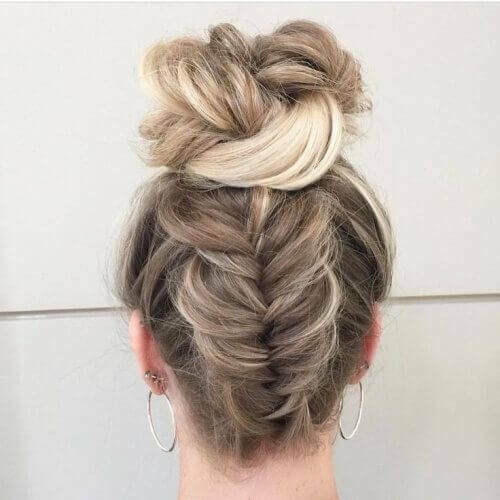 The hairstyle begins with a half French braid and continues in a spiraling motion to form the bun. The result is a spectacularly braided wedding hairstyle to remember. 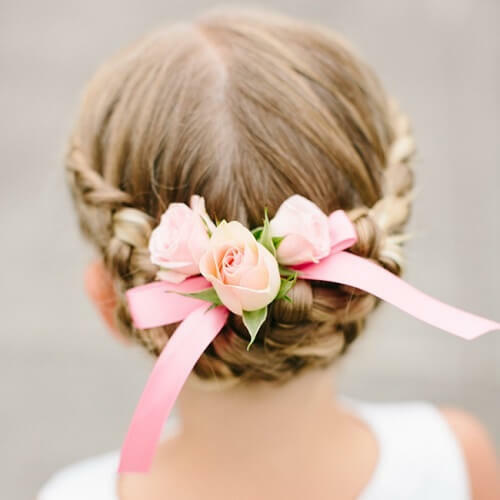 Ribbons and roses are some of the best accessories for wedding updos destined for little girls. Especially if she will be a flower girl, the dainty princess should enjoy multiple hair accessories that will make her feel like a star on the big day too. Nowadays, you will find that the majority of trending wedding updos are loosely styled. This method allows the bride to benefit from her natural beauty, without making her feel uptight as she states her vows. Experiment with different styles until you get the loose look that suits you best. If you are holding your wedding reception somewhere outdoors, such as a forest, you should dress according to your environment. In this case, you can get back in touch with nature using natural accessories, such as a flower crown. Braids are an excellent way to create a unique shape for your bridal updo. 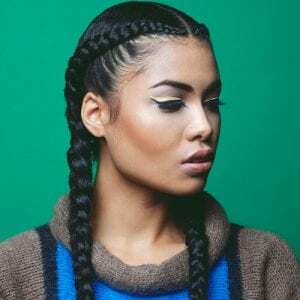 Even though you don’t have to make the hairstyle entirely out of braids, you can use one as the icing on the cake for the look. An example is well-depicted in this shot, with a braid lightly set over the updo. Any bohemian gal deserves an appearance that represents her personality on the day of her wedding. 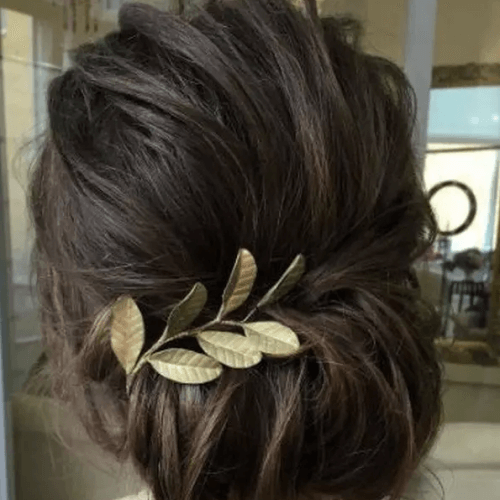 If you’re all about boho chic, you should opt messy wedding updos with well-chosen accessories. Flowers are the best if you’re ever in doubt. Like we described earlier, sweeping your hair to the side adds a touch of refinement to your overall look. For a side swept wedding updo that won’t go by unnoticed, we recommend an option for a half up half down version. Take the lower half and style it over one shoulder. Want to get a striking contrast out of your bridal look? Choose a messy hairstyle. 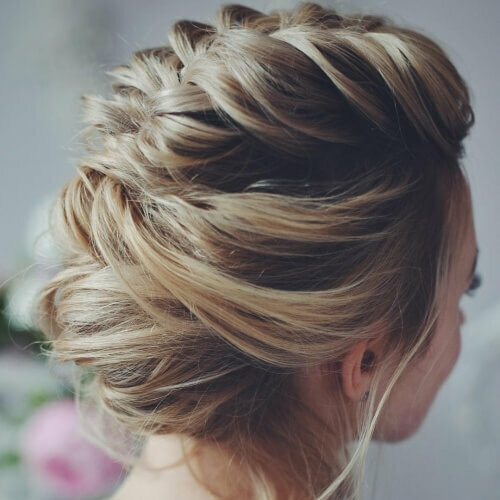 Even though you might not associate the concept of messy with a wedding updo, we ensure that the results will be breathtaking. Just make sure you wear it with confidence. If you’re blessed with Asian facial features, you should do everything you can to let them shine during your wedding. 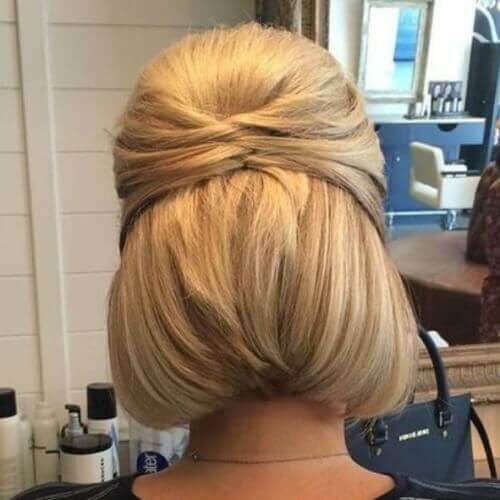 A fully wrapped updo can help you get that outcome. Take note that the updo is loosely styled, and the bangs are delicately parted. Tend to take the unconventional path in all you do? 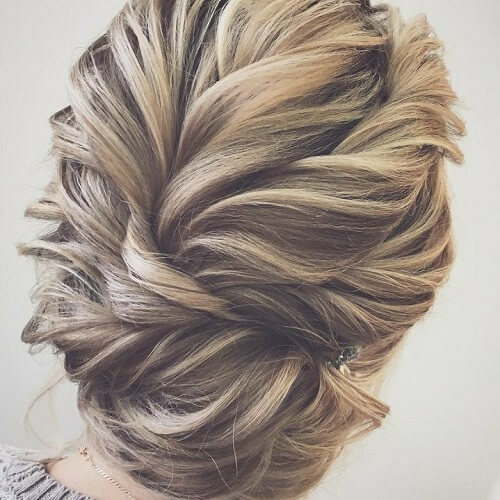 Have fun with a reverse braid updo! Like you can imagine, the braid is created starting from the back of your neck. All you have to do is choose your favorite braiding technique and work your way up into an updo. Yet another way you can wear a fishtail braid for your wedding updo is by incorporating it into a low bun. 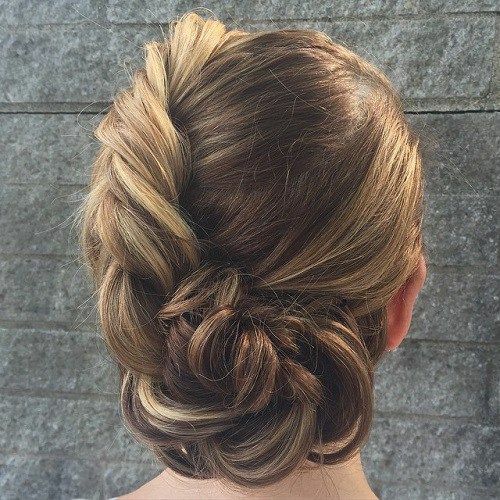 Begin from the top corner of your part and braid your way down and into a swirling bun. It’s a comfortable and beautiful hairstyle you can enjoy all day and night. 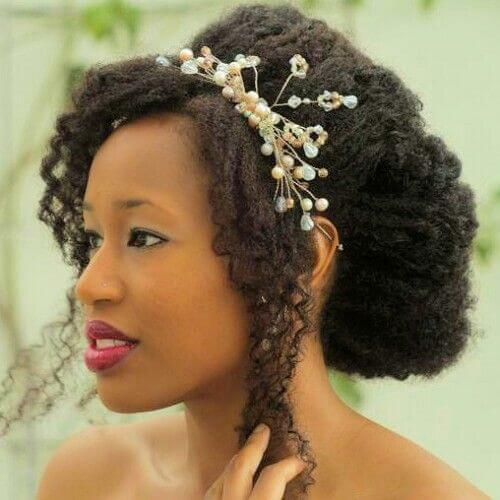 Prefer rocking your natural hair relaxed for your wedding? Go for it! 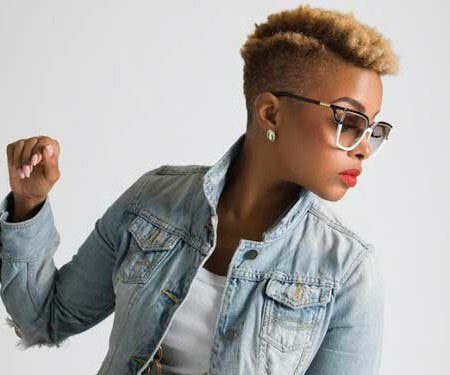 Depending on the length of your hair, you can try out faux hawks, braided crowns or other flattering options. 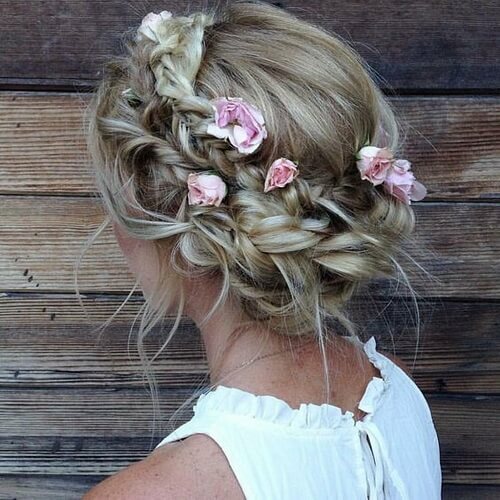 Like with most wedding updos, flowers are always welcome. Regardless of how short your hair is, there are always plenty of possibilities you can explore. For instance, you can try this half up half down look with a twist. Part your hair half up and interweave a few strands for a chic look. Have a strapless wedding dress, with a relatively simple design? You can go all out with an asymmetrical updo. Rest assured that you won’t have to cut your hair asymmetrically, but rather style it in an outgoing and creative fashion. Last but certainly not least, a wedding updo that will undoubtedly give you the spotlight you deserve is the flower bun. Instead of using real flowers to decorate your hairstyle, create your own shape by styling your hair like a rose or other flower. 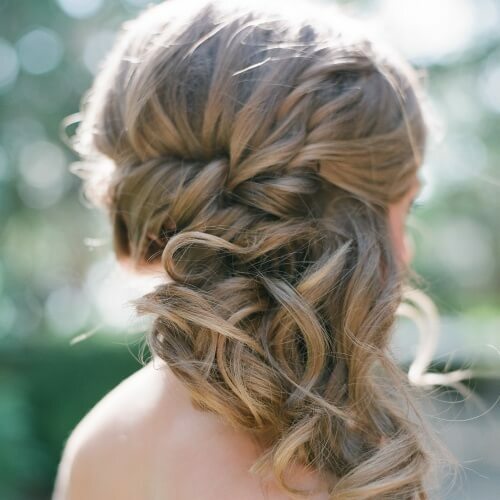 All in all, using a list of wedding updos can help you save precious time prior to the big day. Not only will you reduce the massive stress that comes with preparing a wedding, but you will also find inspiration in details that you didn’t think about before. 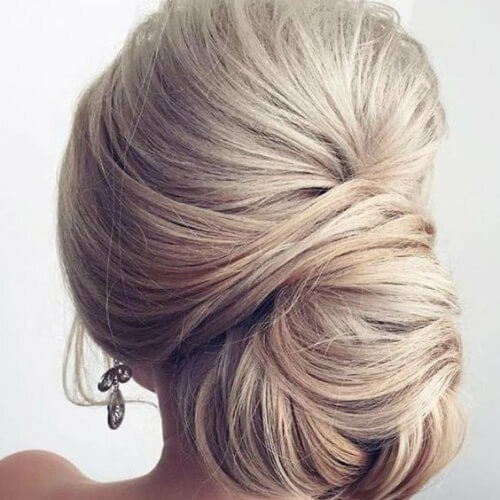 Consider aspects like the texture of your hair when choosing your updo so you’ll have a spotless look. Which one did you go for? Enjoy the priceless memories on your wedding day!